NY GAA by-laws and regulations. 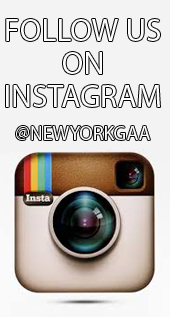 The Association shall be known as the Gaelic Athletic Association of Greater New York. It is affiliated with the Gaelic Athletic Association in Ireland. The objective of the Association shall be the cultivation and preservation of Irish national games and pastimes. The Association shall be strictly non­political and non­sectarian. No political questions shall be asked at any of its meeting. The Association shall be a non­ profit organization. Each club shall be represented at meetings of the Association on the basis of two (2) named delegates per team, or in their absence by duly authorized proxies. A club which does not take part in, its schedule obligations in any Championship competition, shall lose representation in respect of the defaulting team at all meetings of the Association. Suspended clubs shall not be represented at any meeting until they are reinstated. (a) The Annual Convention shall be held on the first Sunday of December. (b) The annual “Rules” Convention shall be held in February, on or before the third Sunday. At the Annual Convention each club shall be represented on the basis of two delegates per club. A club which does not take part in, its schedule obligations in any Championship competition shall not be eligible to make nominations, table motions, vote, or take part in the Annual Convention. In accordance with R. 3.10, T.O. 2016 the Board Convention shall consist of the Officers and Members of the outgoing County Committee (voting as the outgoing Committee), and two delegates from each club that competed in a junior or higher grade championship in the current year. (b) Clubs of nominators, or nominees to any office, must have their affiliation fee paid to the Treasurer prior to the Convention. (c) All delegates for office must be duly accredited representatives for at least one year prior to the Convention at which they will be candidates for office. An elected officer may not hold a position as Chairperson of a Divisional Committee. (d) At the Convention elections a delegate may vote only once on any issue. (e) The names of the delegates and proxies who are to represent the various clubs at the Annual Convention and meetings of the Association must be sent to the Secretary prior to the Convention – The names of the delegates may not be changed after the night of nominations for office. (f) The New York Board delegation to the Annual GAA Congress shall be elected at the Annual Convention. The Chairperson and Secretary of the Association shall automatically be delegates. All other delegates must be elected at the annual convention. At the annual convention the following Officers: Chairperson, Vice ­ Chairperson, Secretary, Assistant Secretary, Treasurer, Assistant Treasurer, Development Officer, Coaching Officer, Public Relations Officer and Youth Officer shall be elected. A member who has served five (5) years in a specific officer-ship shall be ineligible to hold that officer-ship for the ensuing five (5) year period. The Chairperson shall be elected initially for two years (2) and may be re-elected annually up to the maximum five (5) years. The Bye laws of the Association are reviewed each year at the Convention. A simple majority vote of the Convention is sufficient to adopt a Regulation. To adopt, amend or delete a Bye-Law a 60% majority of those present, entitled to vote, and voting is necessary. A simple majority vote of the Convention is sufficient to adopt, amend, or delete, a Regulation. The County Committee shall be the governing and controlling body of all the affairs of the Association within the County, excepting those functions reserved to the Provincial Council and Central Council under the Official Guide. In accordance with R.3.18 the County Committee shall consist of the officers elected at County Convention, the Referees’ Administrator appointed by the County Committee in accordance with R.3.19 (i) T.O. 2016, the Chairperson of the Senior Football Division, the Chairperson of the Intermediate Football Division, the Chairperson of the Junior Football Division, the Chairperson of the Hurling Division, the Chairperson of the Youth Board and two delegates per club from clubs of a junior or higher grade affiliated to the New York Board. All members shall have voting rights. (a) A Committee meeting may only be attended by accredited members of that committee. Non ­member(s) of a committee must leave the room before any discussion, or vote, is undertaken by that committee on any item. (b) All communications, and reports, must first be read at a Regular or ‘Special’ meeting of the County Committee. (c) Any written communication from a Club, or Officer, outlining unacceptable conduct by another club, club member, or team member, shall be dealt with by the Co. Management Committee. (d) No committee may discuss any matter which is not under the jurisdiction of that committee. In particular, the Chairperson of the County Committee and the Management Committee shall be extremely vigilant in not allowing any item which might come before the CCC, or Hearings Committee, or would come under their jurisdiction, to be discussed. (e) The meeting shall be convened by the senior officer present and shall require that at least ten affiliated clubs are represented to form a quorum. In accordance with R. 3.21 T.O. 2013 the County Committee shall appoint the following subcommittees whose powers and functions shall be as outlined in R.3.21 T.O. 2013 and in these Bye Laws. An elected Officer may not be appointed to hold position on any subcommittee. No one individual may hold two positions on any subcommittee. A meeting shall be chaired by the senior Officer present. (a) Management Committee: It shall consist of the Officers elected at the County Convention, the ex-officio chairman for one year after termination of their elected term, and five others all of whom have been nominated by the Divisional Committees and approved by the County Committee. The Management Committee will draw up a format for the Hearings and Appeals Committees which will be subject to approval by the County Committee. (b) Competitions Control Committee (CCC): It shall consist of a Chairperson, a Vice Chairperson, nominated by the management committee and approved by the county committee, the County Secretary, one representative elected by each Division, and the Referees Administrator. All of the members of this committee shall by appointed by the County Committee. It shall be responsible for all arrangements for games, including the appointment of referees and control of any matters arising from games under the jurisdiction of the county committee, including disciplinary matters other than those whose function is reserved to the hearings committee. A quorum for disciplinary purposes will be at least three members. It shall process and make recommendations to the County Committee on the grading of clubs and players. It shall investigate and process matters relating to the enforcement of rules, including the hearing of objections and counter-objections. The CCC shall schedule games four weeks prior to the game if possible. Tie games shall be rescheduled at the discretion of the CCC. The CCC shall be responsible for making decisions on applications for transfer within the County. (c) Hearings Committee: It shall consist of six members, the Vice Chairperson, the Assistant Secretary, and the Chairpersons of the Senior, Intermediate, Junior Football and Hurling Divisions. The Vice­ Chairperson shall be the Chairperson of the Hearings Committee. A quorum of a Hearings Committee meeting shall consist of three members. This is excluding interested parties. A member of the Hearings Committee is an interested party if his club, native County club or a person from his native County are involved in an objection, or any judgment being acted on by the Hearings Committee. A member of the Hearings Committee who misses any meeting on an objection or investigation shall not be allowed to sit in on any subsequent meetings on that objection or investigation. Only appointed members may sit on the committee. Members may not appoint proxies. (d) Appeals Committee: Itshall consist of three named who are not members of any other sub-committee. All of the members of this committee shall be approved by the County Committee. (e) Finance Committee: It shall consist of four named members. The membership will include the Treasurer who will act as the Committee’s Chairperson. It will be responsible, subject to the overall control of the County Committee, for any matters of finance referred to it by either the County Committee or the Management Committee. (f) Planning &amp; Physical Development Committee: It shall consist of the Chairperson, Vice Chairperson, Secretary, Treasurer and four other named members. (g) RefereesAdministration Committee: It shall consist of three named members including the Co. Referees’ Administrator. (h) Coaching&amp; Games Development Committee: It shall consist of four named members including the Coaching Officer. (i) Cultural Committee: It shall consist of three named members. (j) Public/Marketing Committee: It shall consist of three named members including the Co. P.R.O. (k) Youth Committee: It shall consist of three named members including the Co. Youth Officer. (i) Information Technology Committee: It shall consist of three named members. (m) Co. Teams Management &amp; Panels Subcommittee: The membership of this Sub­ Committee shall be as outlined in the Charter for County Committee/Player Relationships as approved by Ard­ Chomhairle from time to time. The functions of this Subcommittee shall be as outlined in Rule 3.22 (ii) Official Guide 2016, Part 1. (o) Health &amp; Wellbeing Committee: It shall consist of four named members. Vice­ Chairperson, a Secretary and a CCC Representative all of whom shall be elected by the Division and approved by the County Committee. Its function shall be to draw up a schedule of games and present same to the Co. Committee for ratification for forwarding to the C.C.C. a Vice­ Chairperson, a Secretary and a CCC representative all of whom shall be elected by the Division and approved by the County Committee. Its function shall be to draw up a schedule of games and present same to the Co. Committee for ratification for forwarding to the C.C.C. r) Junior Football Divisional Committee: It shall consist of a Chairperson, a Vice­ Chairperson, a Secretary and a CCC representative all of whom shall be elected by the Division and approved by the County Committee. Its function shall be to draw up a schedule of games and present same to the Co. Committee for ratification for forwarding to the C.C.C. (s) Hurling Divisional Committee: It shall consist of a Chairperson who shall be the Senior Hurling Chairperson and elected by the Senior Hurling Section, a Vice ­Chairperson, who shall be the Junior Hurling Chairperson and elected by the Junior Hurling Section, a CCC Representative, who shall be elected by the Senior Hurling Section. Each section shall have an Assistant Chairperson, Secretary, and all shall be approved by the County Committee. Each section shall draw up a schedule of hurling games, and present same to the County Committee for ratification for forwarding to the C.C.C. (t) Minor Board Divisional Committee: The Youth Division is recognized as a division of the New York Board. It shall have the same status and is entitled to the same privileges as all other divisions. It shall consist of a Chairperson, Vice-Chairman, Secretary, Assistant Secretary, Financial Officer Assistant Financial Officer, PRO, and Delegate to Congress. Its function shall be to conduct the day to day business within the youth Division with a monthly report submitted to the County Secretary and to draw up a schedule of games at all levels and present same to the Co. Committee for ratification for forwarding to the C.C.C. CHAIRPERSON: The Chairperson shall preside at all meetings of the Association other than those provided for in the Constitution. They shall impartially put all motions, duly seconded and in order, to a vote and declare the result thereof. They shall have the casting vote. They shall nominate for appointment by the Co. Committee, all Committees necessary for the welfare of the Association, other than those provided for in the Constitution. The outgoing Chairperson shall continue as an officer “ex­officio”for one year after the termination of their elected term. The Chairperson shall automatically be the NY Board delegate to the Central Council of the GAA. VICE CHAIRPERSON: The Vice ­Chairperson shall preside at all meetings of the Association in the absence of the Chairperson and shall be governed by the same rules as the Chairperson. They shall preside over all meetings of the Hearings Committee. SECRETARY: It shall be the duty of the Secretary to attend all meetings of the Association and keep a correct account of all business transacted and give a full report at regular meetings. They shall give a report at each regular meeting of the Association of the business transacted at the Committee meetings. It shall also be the duty of the Secretary to receive and read at meetings all correspondence in connection with the Association, and to reply as directed by the Association, or by the presiding officer, at meetings of the Association. They shall keep a correct list of all delegates representing clubs. ASSISTANT SECRETARY: The Assistant Secretary shall provide assistance to the Secretary in their duties as outlined, and substitute for the Secretary in their absence. TREASURER: The Treasurer shall keep the funds of the Association in a checking account in the name of the Gaelic Athletic Association. There must be two signatures on all checking accounts. All withdrawals from the checking account shall bear the signature of the Treasurer and the Chairperson. They shall act in conjunction with the Assistant Treasurer at games. The Treasurer is not subject to the maximum period in office of Five (5) years. ASSISTANT TREASURER: The Assistant Treasurer shall receive all funds, dues etc. of the Association and hand them over to the Treasurer. It shall be their duty to collect the expenses of the teams and referees and have same for the Treasurer at the following meeting. DEVELOPMENT OFFICER: The duties the development officer shall include, but shall not be limited to, enhancing the development of underage hurling and football, advancing relationships between the Board and other jurisdictions, particularly in North America, developing and managing summer coaching camps and other responsibilities as deemed appropriate by the Board of Officers. YOUTH OFFICER: The duties of the youth officer shall be to, but shall not be limited to, oversee and coordinate all youth activities as deemed appropriate by the Board of Officers and they must also be actively involved in the Youth program within the region. A player who has been included on an Inter county Senior Football Championship list submitted to the Referee, in accordance with Rules of Specification 2.5 (ii) (a) T.O 2016 for a game in the current year’s Championship shall not be eligible for Registration as a 30 day sanction player in the New York Board jurisdiction for the year in which his name appeared on a Senior Football Inter County Championship list. Sanctions shall not be accepted for registration by the NY Board after July 1st. Each senior football team shall be allowed four (4) 30 day sanction players. A newly promoted senior team, shall be allowed two additional sanctions in their first year, and one (1) additional sanction their second year. Each Intermediate football team shall be allowed three (3) 30 day sanction players. Each Junior A football team shall be allowed two (2) 30 day sanction players. Junior ‘B’ football teams shall not be allowed any 30 day sanction players. Each Senior Hurling team shall be allow four (4) 30 day sanction players and two (2) players under weekend authorization for semi finals, and Finals. A Junior team advancing to Senior their first year, be allowed six (6) 30 day sanctions. Each Junior A Hurling team shall be allowed (3) 30 day sanction players. Hurling Sanctions must be with the County Secretary no later than June 15th to be an eligible sanction. To be eligible to participate in the play­offs a 30 day sanction player must have played (either started or come on as a substitute) in at least two qualifying games for those play­offs. Penalty: Loss of game. A player who transfers to a club in Ireland and returns to New York as a 30 day sanction player in the same season may only play with the club from which he transferred. Deadlines outlined in Rule 6.13 (b) (iv) T.O. 2016) apply. A 30 day senior, intermediate or junior football sanction player who has played four or more championship games in New York and who returns to Ireland, shall be allowed to play with their clubs in Ireland, and return to NY, as a weekend player, subject to rule 6.13. T.O. 2016 for the championship playoffs. Championship play­offs shall be quarter­finals, semi­finals and finals. Elimination games are not covered under this rule. A 30­day sanction player who remains in the New York jurisdiction upon completion of his sanction and who transfers to New York must transfer to the club he was sanctioned to for a minimum of one year. A 30 day sanction players who is the property of an intermediate or junior team and who remains in the NY jurisdiction upon completion of his sanction, and who has transferred to New York by March 1st, is eligible to be drafted. No Senior inter county footballer, who appears on his county panel in either League or Championship, this current year, or year prior shall be eligible for a sanction in the Junior A football division. The rules governing the drafting of players shall be made at Annual Convention. A player must be a legitimate intermediate or junior player in order to be drafted. A legitimate intermediate or junior player is defined as any player transferred into NY by July 1st, the year prior to the draft. a) Senior Football Drafts: Three (3) from either the Intermediate or Junior Divisions plus three (3) who are or were in the minor grades of the NY Youth Division. A team or teams promoted to the Senior Division shall be allowed five (5) from either the Intermediate or Junior Division plus three (3) who are or were in the minor grades in the NY Youth Division, their first year at senior level. b) Intermediate Football Drafts: Seven (7) from the Junior Division with a requirement that four (4) of the seven (7) drafts are or were in the minor grades in the NY Youth Division. With the exception of a club which has come through the Youth Division and has a team they be allowed eight (8) drafts from that B team only. c) Junior A Drafts: Junior A football teams be allowed to draft six (6) from Junior B with a minimum of three (3) who are or were with a club in the minor grades in the New York Youth Division. d) Senior Hurling Drafts: Eight (8) from the Junior A Hurling Division who played in the prior year’s championship with a requirement that two (2) of the eight (8) drafts are or were in the Minor grades in the NY Minor Division. Senior and Junior A hurling teams may draft an unlimited number of Junior B players during the playing season provided that these players were registered and approved as eligible Junior B players prior to the start of the playing season. 2) A player’s status as a junior or intermediate player in the previous year’s championship shall determine draft eligibility. 3) Players on a team who end their season at the bottom of the table, and are being relegated from Senior to Intermediate, or from Intermediate to Junior shall be deemed to have competed at their new level in the previous year’s competition and are eligible for the draft. 4)Players on an intermediate or junior winning championship team, which is promoted and who were not drafted, who transfer to avoid promotion, or to remain in the division shall be ineligible for the draft that year. a. A player who has played Inter County Hurling in Ireland at any level, U­18, U­21, and Senior in the current or previous season is ineligible to play in the Junior Hurling Championships. b. The Junior B Division is intended for hurlers who have come through the New York Minor Division or newcomers to hurling. Therefore any players that did not attend high school in the United States must submit a written request to the New York Hurling Division requiring special dispensation to play Junior B Hurling in New York. This request must be approved by the County Committee. Requests must be submitted prior to the start of the playing season. Players who have appeared in adult, or minor (U18) championship hurling at any grade club, or county in Ireland are prohibited from making this request. 2) Any player desirous of leaving one club to join another club must apply to the County Committee for a transfer. A player can only transfer club to club once every two years i.e. : if a player transfers in 2014 he is not eligible to transfer again until 2016, if a player transfers in 2015 he is not eligible to transfer again until 2017. Inter County transfer players are not exempt from this rule. (General Rule: A transfer becomes effective as soon as it is granted by the appropriate authority). 4) All transfers must comply with R. 6.5, T.O. 2016. 5) A Team may not receive more than Eight transfers in a given year. This includes internal and Inter county transfers. However no more than three of these may come from one club internally. Any player who has not played in the previous year still must transfer before July 1st but will not count against the eight. A club with two teams must deem which grade each of their Inter County Transfers will be playing with, that player will not be allowed to advance to his higher grade team his first year. 6)A player or players may not transfer to a team of any club which has not competed in or completed its schedule obligations in the previous year's’ championship. 7) Deadline for all inter county transfers to New York will be July 1st. 8) Wristband system will be used for all play­off games. A player must produce his New York GAA Registered ID card, and, be found in order by the presiding officer, whom shall refer to the County Boards duplicate copy before issuing a wristband. Wristband must be worn throughout the game. All teams when affiliating at the start of the season must submit the names of the Chairperson, Vice Chairperson and Secretary of the club together with the names of the delegates and proxies. This remains the official list until the club notifies the Association in writing of any changes. The new list shall be read out at a regular meeting of the Association. The winner of the Intermediate Football championship shall be promoted to the Senior Division except where the club already has a senior team. The winner of the Junior Championship shall be promoted to the Intermediate Division unless the club already has an Intermediate team. When the winners of the Junior or Intermediate division are promoted the team at the bottom of the division to which they are promoted must be re­graded. The team that finishes at the bottom of the Senior Hurling Division shall be relegated. In the event of two teams being tied on points at the bottom, a play­off shall take place to decide who should drop down to junior. Only the team which has won a Division Championship the previous year may be promoted the following year. 3 a) A new Football or Hurling team must have twenty playing members before it can be affiliated. Players who played in the previous year’s championship cannot be included on the list, submitted with the application for affiliation, or play for a new club with the exception of players going to their native County which will be limited to 2 players. b) A player or players may not transfer to a team of any club which has not competed in or completed its schedule obligations in the previous year’s championship with the exception of players going to their native County which will be limited to 2 players. All games, competitions, events or awards involving the Association, its clubs, teams or players must have the prior approval of the New York Board. A written request must be made to the Board by any person, club, organization or corporation wishing to stage or sponsor such event or award. Affiliated clubs may not play non­affiliated or suspended clubs in organized areas. In areas where there is no organization or with schools with organized areas the Association may grant permission. Each club is responsible for the conduct of its players, officials, and members while participating in any of the activities of the Association. All suspensions by a recognized authority here and in Ireland shall be honored. Members of a suspended club cannot compete with any other club during the term of the suspension. No suspended player shall take part in any league, championship, or exhibition game until the term of his suspension has been completed. Perpetual cups shall be provided for the New York Championships. They shall be presented to the captains of the winning teams on the day of the final. Such cups shall not bear the name of any living person. The Association will provide a set of twenty five standard medals, emblematic of the Association to the winners of the Senior, Intermediate and Junior Football, Senior and Junior Hurling and the U–21 Championships. These medals shall be without commercial endorsement. Any club which loses, damages, or fails to return a championship trophy to the Association before the start of the playing season shall be required to pay the cost of repairing or replacing same. Divisional Chairperson shallbe responsible for notifying Clubs of the return date. All communications received at a regular meeting shall be read at that meeting. All business handled at a division level shall involve that division only. At the conclusion of the year, prior to, or at, the Annual Convention, the appropriate officers, including but not limited to, the Treasurer, Secretary, PRO, and Development Officer, shall present annual reports to the body. The end of a meeting shall be considered as the deadline for close of Board or Division business which is designated to be completed by a particular day or date. The first meeting in January shall be the deadline for applications to affiliate all teams. Only scheduled Championship or league games shall count towards working off of suspension. Schedules shall be drawn up by CCC four weeks prior to the game when possible. A) All clubs are required to register their players on official New York Board registration forms accompanied by two pieces of photo id for each player on the list. The Registrar shall hold one set of ID cards and the registration forms and the club shall retain the duplicate set of ID cards. Beginning April 1stall players must produce a New York GAA photo ID when requested to do so by the referee at the request of the opposing team manager. Penalty for infraction: loss of game. B) A player who has been included on an Inter county Senior Championship list submitted to the Referee, in accordance with Rules of Specification 2.5 (ii) (a) T.O 2016 for a game in the current year’s Championship shall not be eligible to be accepted for Registration as a member of any club in New York Board jurisdiction until his county has been eliminated from the Intercounty Senior Championship. C) Prior to his first game a 30 day sanction player must register in person with the New York Board. To register the player must produce his valid passport and submit his New York Registration ID card along with two (2) passport size photographs to the Assistant Secretary or the Secretary of the County Board. Failure to do so shall result in loss of game for club and one game suspension for player to be served with that club. D) Prior to his first game, an intercounty transfer player must register in person with the New York County Secretary. To register, the player must complete his transfer request, produce his valid passport, (28 day residency requirement) and submit his New York Registration ID card along with two (2) passport size photographs to the Secretary of the County Board. 20) A player is regarded a senior, intermediate, junior or minor according to his competition. 21)A player may not play with two teams in the same competition. 22)A junior or intermediate player may be advanced by registration to a senior team of the same club name. However if he takes part in any senior competition he may not play junior or intermediate again in the same year. 23) Players being re­graded at the start of the playing season must stay intermediate/ junior for two games. However if the intermediate/junior team is knocked completely out of the competition before they play two intermediate/junior games they are permitted to go back intermediate/senior after their intermediate/senior teams next scheduled game of that year’s competition. However they cannot be re­graded again in that year’s competition. 24) A senior team seeking to be re­graded may only drop one division subject to CCC approval. 25) Each competing team shall furnish a list of its players in duplicate before the start of game to the referee. This list shall contain the name of each starting player and the names of the substitutes in full. The referee shall sign both copies and give one copy to the opposing team captain and the other copy must be submitted with his report. Official forms must be used for lists of players and substitutes. 26) Upon entering the game all substitutes shall submit their names in full and in writing to the referee. All names on these lists shall be printed. Abbreviated Christian names are acceptable. 27)In the event of a clash of colors both teams shall change jerseys. 28) Any senior team withdrawing from a senior championship competition shall only be permitted to return at a lower level subject to CCC approval. 30)Ninety minutes is allowed for each game on Sunday. Teams arriving fifteen minutes late: loss of game. In the event both teams are late the game shall be played for the amount of allotted time left for that game. Both teams must leave the field at the end of time allotted for said game. 31) Each club shall be assigned on a rotating alphabetical basis to man the main entrance and sideline gates each Sunday during the playing season. 32) The Presiding Chairperson shall appoint an Officer to officiate on a given date. The Officers shall rotate according to seniority and shall be appointed at the first reading of the schedule for that date. The Officer of the Day shall have the authority in the absence of the officially appointed referee to appoint a referee if the teams about to compete do not agree to one. 33) If players get injured in International games or in training for such games the New York Board is regarded as their club. 34)Official programs shall be printed for all finals played. 35)A team arriving fifteen minutes late for a game: loss of game. 36)The National Anthems of Ireland and the United States of America shall be sung at appropriate G.A.A. occasions. The National Anthem of Ireland shall be sung in Irish on all such occasions. 37)When a game is played, and the points are awarded to a team, the opponent must lodge an objection, in accordance with R.7.10 (c) T.O. 2016, if they wish to claim the points based on a violation of any of the Board’s bye ­laws or regulations. 38)The New York Rule Book shall be updated as soon as possible after the Convention and the bye­laws, approved by the Management Committee in Croke Park, on behalf of Central Council, along with the Official Guide shall be the sole guideline for conducting the business of the Association by the New York County Board. 39)Players of the Year in all grades to be represented at the GAA Annual Dinner Dance as in U­21, Senior, Intermediate, Junior Football and Hurling. Players to be selected by the Board of Officers of the New York GAA. A player or club official who behaves in a disorderly fashion, calculated to bring the Association into disrepute, shall incur a minimum suspension of 8 weeks up to a maximum of 48 weeks. When a player refuses to leave the field after being ordered off by the referee, the referee after a lapse of three minutes shall terminate the game. Penalty to the team: loss of game, Penalty to the player: 24 weeks suspension. Abusive language towards a Referee, Umpire or Sideline Official. Any type of assault on an opposing team official after the conclusion of a game shall be suspended for a minimum of two (2) games. A) A player who strikes a referee, linesman, umpire or any other official, first offense – 48 weeks, second known offense – 96 weeks, third known offense – expulsion from the Association. B) A player who pushes, shoves, or makes physical contact, including striking with a ball, a referee, linesman, umpire or any other official, first offense – 24 weeks, second known offense – 48 weeks, third known offense – expulsion from the Association. C) A player reported by the Referee as having committed offences under rule 3 and 4, after the conclusion of the game, shall likewise stand suspended as outlined in rule 3 and rule 4, under penalties. When a player, hurler or footballer is ordered off the field by the referee, he is automatically suspended, and remains so until his total period of suspension shall be decided by the Presiding Officer at the meeting at which the referee’s report is read. A player who has been suspended must serve the suspension with the team he was sent off with. A player who is sent off twice in the same season for two yellow card offenses shall be suspended for his next game with the team he was sent off with. First offence ­ the game shall be awarded to its opponents and the club fined $500. Second offence ­ disqualification from the competition for that year. Players giving the wrong names to the referee shall incur the following penalties, first known offense – one game suspension and one game added for each such offense thereafter. Omitting the name of a player from the list given to the referee or failing to submit the name of a substitute – loss of game. Penalty for playing an illegal player – loss of game. Penalty for player – suspension for the remainder of all of his teams playing season. No suspension shall exceed two years. Players repeating offenses which merit such suspensions shall be debarred from playing. A player who is the property of his Irish Club and is playing on a weekend authorization or 30 day sanction who is sent off and will be returning to Ireland will have the appropriate penalty from TO apply. His County Secretary and Croke Park will be notified immediately. With the introduction of the black card system that combination or any three cards over the playing season in any competition result in a game suspension i.e. : two black cards and a double yellow would result in a game suspension for a player. Each Division shall be required to submit its schedule to the County Committee before the first meeting in March each year. C) The team having the most points at the conclusion of the league shall be the winner of the league or section. When a team has played half its schedule and does not complete it, the results of the games played stand as finally recorded, and the unplayed games are awarded to the scheduled opponents. If a team withdraws with less than half its schedule played the games played or unplayed shall not count for or against its opponent. That a minimum of one person of a team’s management have completed at least Level 1 coaching by Jan 1st 2017. Coaching workshops are provided by the Board. Schedules shall be drawn up by the CCC four weeks prior to the game when possible. A playing schedule cannot be objected to after one reading. Tie games shall be rescheduled at the discretion of the CCC. Any cancelled games shall be rescheduled for the first open date. A) If their County is playing in the All Ireland Senior final. B) If two teams from the same club are being scheduled on the same day. When schedules are drawn up the games shall be numbered to avoid argument or confusion. A complete schedule which details each fixture, location and date will be available to all clubs prior to the start of the season. The senior or intermediate or junior football finals shall not be played on the same day. In the event of overtime being required it will be played as two ten minute halves. Vice Chairperson, the Secretary, the Chairperson of the Senior Football Division, the Chairperson of the Intermediate Football division and the Chairperson of the Junior Football Division. The captain of the New York Football team shall be elected by the New York Senior Football players’ panel. The manager and selectors of the New York Hurling team shall be elected by the Senior Hurling division subject to approval of the County Committee. The other New York Football and Hurling team officials shall be elected by the Hurling and Football divisions as each division sees fit subject to the approval of the County Committee. Rules 1, 2, 3 and 4 above are subject to ratification by the County Committee. The funds of the Association shall not be appropriated for any purpose other than the necessary expenses required for the running of the Association. The affiliation fee is $100 per club per year. Affiliation for a new club, or a club who did not participate the year prior will be $500 for the first year and a $100 per year thereafter. Each Hurling club shall be allowed a $500 allowance per club towards the purchase of hurleys. A financial report shall be read out once a month at a regular meeting of the Association. The Financial Secretary's report shall be read out quarterly at a regular meeting of the Association. All Ireland tickets shall be paid for, by everyone, when tickets are given out or distributed. Referees shall be admitted free of charge to games on days on which they are officiating. Referees shall be compensated $50 per game for expenses. All objections must be lodged in triplicate with the Secretary within three days of the game. The objection shall be decided at a regular or special meeting of the CCC. A counter objection must be lodged in triplicate within three days of the final hearing of the objection. It shall be decided by the CCC from whose decision there shall be no appeal. No other form of appeal shall be entertained. All objections and counter objections must be lodged in triplicate form, one copy of which shall be given to the club against which the objection or counter objection is lodged and accompanied by a fee of $50 which shall be forfeited if the objection or counter objection is not upheld. All members of the CCC and parties involved shall be notified by the Secretary when the objection or counter objection is being heard. An objection or counter objection must be based upon the violation of the rules or bye laws of the Association. It shall be compulsory upon the party lodging the objection(s) or counter objection(s) to quote in full the rule or rules alleged to have been violated. An objection or counter objection shall be finalized not later than two weeks after the objection or counter objection is lodged. The CCC or Hearings Committee shall under no circumstances order a replay. The CCC or Hearings Committee shall deduct or award the points according to the merits of the case plus all the facts as known to the officers of the Association. The tendering of false or forged evidence shall entail suspension of the guilty party for not less than twelve months. The Hearings Committee may at a special meeting review its decision in case of doubt, where evidence of falsification exists. Save as provided for in the rules no appeal shall be made to any County Board or Committee. In particular no appeal shall be made to any court of law or to any outside body. This applies to all matters. The basis for an objection(s) to a player(s) shall be the legality of that player(s) in the current or previous year’s championship. When the CCC reaches a decision on an objection submitted by any club the club in question shall be informed in writing how and why they reached that decision. The CCC appoints referees for all games. Control of the matches shall be entrusted to the referee, umpires (4) and linesmen (2). All questions affecting play shall be decided by them. Referees umpires and linesmen shall be properly attired for all semifinals and finals. The referee’s decision on questions of fact connected with the match shall be final. Players should particularly note that the ball is in play until the whistle sounds. Any stoppage in play on their part is at their own risk as any score made as a result of the whistle not sounding shall be perfectly valid. Receive the list of players, sign them and give one copy to the opposing team captain. Report any failure to receive lists to the Officer of the day. Throw in the ball at the commencement of play in each half and allow or disallow a score. Indicate when and where frees are to be taken. Consult with the umpires and linesmen when the need arises and in case any of them withdraws before the end of the match appoint a substitute. Keep a record of the scores and forward a report of the match with the names of any players ordered off and why, players injured and replaced, substitutes coming on to play, the intrusion of unauthorized persons and the names of players or officials interfering during the course of the game. These latter may be penalized at the discretion of the CCC. Referees are expected to turn over their report of the game to the officer of the day on the Sunday of the game or at the next meeting for a midweek game. When a referee is directed by the governing body or it’s properly constituted committee’s to submit further details or explanations of a game and refuses to do so, he shall be suspended from refereeing for a period of six months. Referees cannot make the award of a game but must report the final score. The awarding of a game rests with the committee or council concerned acting on his report. The referee shall have the power to declare the ground or other conditions unsuitable for play after consulting with the officials in charge of the fixtures. The referee shall have the power to terminate the match for want of light, because of constant outside interference or any other reason he considers sufficient. In cases of deliberate delay in pucking out the ball in hurling or in kicking out the ball in football, the referee shall have the power to stop the clock. Should a team commit a foul before the full time whistle has sounded, the referee must allow time for the free to be taken. A score can result from such a free only when no player from the same team touches the ball other than the player taking the free. The referee shall have the power to abandon a game if a player refuses to leave the field when ordered to do so by the referee. Once having given a decision the referee after sounding the whistle shall not alter it. There shall be two linemen appointed by the referee who shall be provided with flags. Their duty shall be to decide when and where the ball crosses the sideline and which team is entitled to the kick in or puck in. When a linesman cannot determine which team is entitled to the kick in or puck in the lineman shall throw in the ball himself. The linesman shall take one side of the ground just outside the field of play changing sides at half time. They shall hold up the flag when and where the ball is out of play pointing the flag in the direction of which the ball is to be kicked or pucked. A team must wait till until the next break in play before replacing a player who has been issued a Black card. 17) Schedules shall be drawn up by CCC four weeks prior to the game when possible.